The finest thing on Television this year. I am quite confident that nothing will better this. A drama, written by Peter Bowker, that essentially covers the timeline of the US / UK led Irag war and its devastating aftermath on that Country, and, to a lesser extent, the United Kingdom, was an emotional, gripping and powerful validation of what the BBC can still produce in terms of Quality Drama. 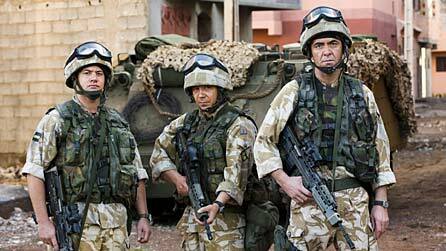 Occupation follows three central characters, Colour Sergeant Mike Swift (James Nesbitt), Corporal Danny Peterson (Stephen Graham) and Lance Corporal Lee Hibbs (Warren Brown), as they fight the war in Iraq, and how they are unable to move on from the conflict afterwards, because the conflict seems to have no end. Some, like Peterson, try and profit from the situation, which seems perfectly reasonable when you consider the recompense they get for serving their country in war-time. Others fall in love, like Hibbs and Swift, and their emotions ultimately lead to heartbreak for them. Occupation is both a love story, a war story and a thriller, and its ease of transition between these different scenarios is effortless. Shown over three consecutive nights on BBC1, on June 16th through to 18th, this format allowed for a more intense viewing experience, and was the right viewing format to go with. Congratulations to the BBC for making that choice. The central performances were superb. James Nesbitt, as the man torn by love and duty, to both his country and his family and the woman he loves, was excellent as the caring and emotional medic. One scene, where he sits on his bed in the soldiers quarters, his back to camera, breaking down with the futility of his situation, in love but with impossible odds of ever finding happiness with her, the only indication we have of his despair is his slumped, shaking shoulders. This simple scene is both subtle and more powerful for its framing. His story, arguably the most tragic, culminates in him losing too much. As a dramatic device, these final, climactic scenes in the drama were incredibly depressing and powerful, if a little contrived. Stephen Graham, as the entreprenurial Peterson, is superb (as always, as his turn in Shane Meadows’ ‘This Is England‘ proved) with his mix of vulnerability and menace. He is at his best when showing the debilitating effects of war – the post combat stress and boredom of being dumped back in to civilian life with no checks or measures to ensure that you are able to cope with the sudden depressurisation that follows release from combat. The one scene I thought particularly stood out was when Peterson, back in England, confined to a bedroom furnished more to the taste of an old woman, takes some speed and ends up getting more and more agitated and restless, frustrated and impotent, unable to find an outlet for his energy, until finally ending up hanging off his balcony several floors up. The staccato rhythm of the edit in this scene and the increasing agitation and menace that Graham brings to the character of Peterson is a real highlight of the series. Completing the trio, Warren Brown as Hibbs brings a naivity and vulnerability to the Soldiers experience in Iraq. His (platonic?) love of Yunis, the Iraqi translator who works with the Pacific Solutions contractor business set up by Peterson, and of which Hibbs is part of, is touching and childlike. Yunis’ shocking and unneccesary death (for ‘collaboration’ with the British) is the catalyst for Hibbs plunging into profound despair. Plagued by his friends death, he tries to make amends by tracking down Yunis’ family, and handing over big bundles of contractors cash as recompense. This decision leads him to being kidnapped by a militia group (a plain clothes Englishman in the heart of Basra sticks out like a sore thumb and is obviously going to attract attention). Kidnapped, bound and with a hood covering his head, he is scared and confused, beaten and broken. What happens next is some of the most heart stopping television of recent memroy. Evoking the grim memories of the kidnappings of Western contractors and military personnel, such as Nick Berg and Kenneth Bigley, a padlocked trunk in a basement is unlocked, and a machete, videocamera and tripod, a flag and orange overalls are slowly unpacked. These are now potent symbols in the post 9/11 world, seared into our mind from snatches of grainy video broadcasts that news agencies broadcast to accompany the news of Westerners Kidnappings in Iraq. In the scene in Occupation, Hibbs is lifted up, undressed and then made to dress in the jumpsuit. The black flag, inscribed with arabic, is fixed against a wall. The camera is set up. The machete is wielded. Hibbs, who is sat down in a white garden chair that is ominously (but also almost casually) stained with blood, is forced to read a statement stating that he is a private contractor and he, the US and the British military should not be in Iraq. Again, he states “I Should Not Be Here”. These words, again almost childlike in their despair, confusion and protest, are heartbreaking. They are addressed to the World and to himself. However, these performances are not the only ones of note. Adam Beresford, as Richard Swift, Mike’s Son, is brilliant in the space he is given, going from a teenage son of a soldier, largely in the background, insignificant, to a frightened recruit, an occupier in the war zone, an enemy to many. Paralyzed by the hostile and unforgiving environment in Basra, he breaks down to his Father, who tries to reassure him that all Soldiers feel scared, but they have to get on with it. It is a typical Father / Son exchange. However, when he is caught up in an insurgency, he struggles to stay calm and sane, frantically trying to call his Dad on his mobile, a naive and touching belief that his Dad can somehow fix the mess he is in, is another profoundly moving moment in this production. Also, Monica Dolan, as Mikes Wife, Nicky, has strength and dignity in her heartbreak, her timing devastating when she asks Mike the question he knew must have been coming, but somehow forgot to prepare for it. His love of the Iraqi Doctor Aliya is probably doomed. I will not spoil it for you, but the longing and frustration of these lovers, divided by cultures, geography and war, is tangible. A brilliant exploration of this war – it effectively shows the misery of the Iraqis who were freed from the grip of the Saddam Hussein dictatorship, only to enter a terrible and unforgiving power vacuum where death and destruction was (and to a lesser extent, still is) commonplace. The British Soldiers who are central to this story are fictional, but what is ever present in the mind is that the chaotic and desperate scenes in the rundown and struggling Hospitals are real, that the grief of the widowed, of those parents who lose their children, are all too real. These are not easy things to forget, and we should not do so.